i. 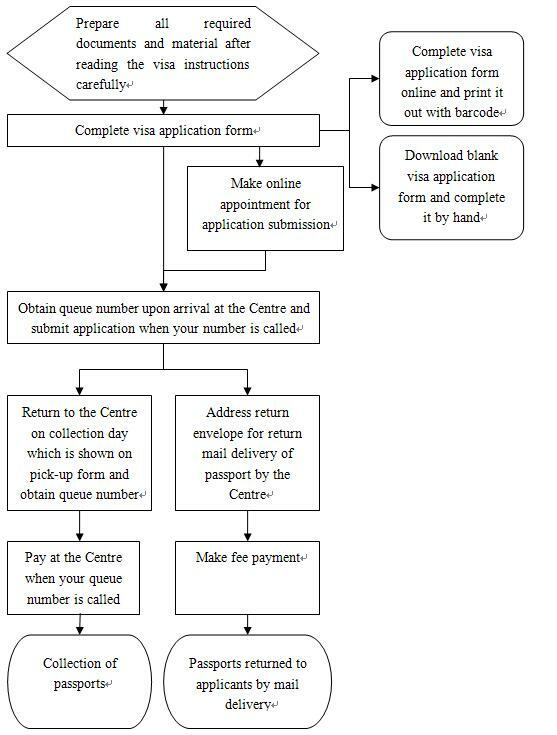 View the visa instructions by logging on the Centre's website. The website will be operational when the Centre opens. ii. Complete the visa application form online before you go to the Centre by logging on the Centre's website. iii. Make appointments online for submission of applications at the Centre.Application without appointment will not be accepted. iv. The Centre has no involvement in the visa assessment and decision- making process. Whether a visa is to be issued or not to be issued, and what type of visa to be issued as well as its period of validity, number of entry and duration of stay shall be decided by the Chinese Embassy in the light of China's relevant laws and regulations. The Chinese Embassy has the right to request the applicant to provide additional supporting documents or to come to the Embassy for an interview. v. An applicant shall be charged for a service fee which will have to be paid regardless of approval or rejection of his or her application by the Embassy. The service fee is set at 30GBP to 40 GBP (excluding VAT) based on services and cost, and non-refundable. vi. Other agencies can still receive visa applications, however, all the applications received by them should be forwarded to the Centre. vii. The Centre will be open both in the morning and in the afternoon Monday to Friday. The Centre also offers same day or next working day services. More information will be released on the website of the Chinese Embassy.